VP Communities, Emily Harrison has met with Alan Whitehead, MP for Southampton Test, to discuss support for one of our students who is facing ‘significant Visa issues’. 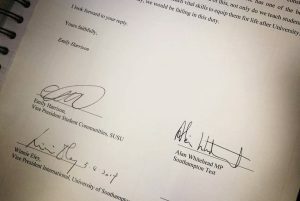 Together with the University’s Vice President International, Emily is sending a letter to the Home Office to appeal on behalf of the student. 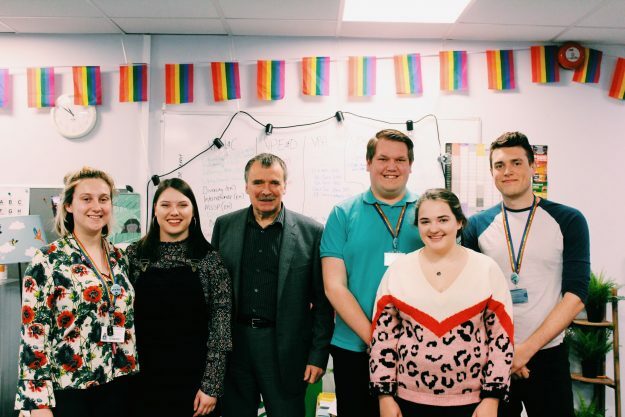 “The student first came to me a couple of weeks ago and I am delighted to have received such positive support from everyone I have reached out to in dealing with this case, including from Alan and the University,” says Emily. “Things like this are exactly why I ran to be in this job because I believe representing and advocating for students is so important. It is a privilege to be able to use my voice in this role to support students”. Sabbatical Officers are here to help you. If you are dealing with a similar issue or any other issue and you need help with representation please talk to them. You can find a full list of officers, along with their contact details, here. Your Sabbatical Officers are located in the office on level two of building 42, drop in to talk to them about any project, idea or issue at any time. Alternatively, the details of our independent Advice Centre can be found here.